CSN Blue Mountain Collision opens its new 10,700 square-foot shop in Collingwood, Ontario, equipped with Symach’s unique FixLine system. This includes a layout and repair process that combines the company’s patented Drytronic technology, specialized drying robots and the Symach Paint Application Process. Established in 1977, the family-owned and operated company serves the Blue Mountains and Collingwood area. The new collision center replaces the old 5,200 square-foot location. Symach provided all of the equipment, including a SprayTron spray booth, two robots for drying paint, a new paint mixing room, a professional vacuum sanding system, a CarMover and lighting. 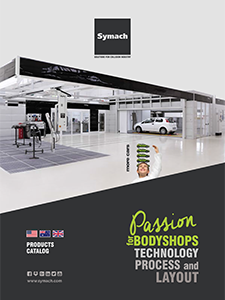 “We were very happy to support Albert and Blue Mountain Collision in this new challenge and help design and automate the new shop,” said Osvaldo Bergaglio, CEO of Symach. “We have studied the shop’s layout and business plan to optimize production and efficiency.” Bergaglio said that within the first month of operation the shop will benefit from utilizing the Symach System. The cost of repairs is estimated to be reduced more than 40 percent and have an average touch time of 1.5 days. While attending the NACE Expo in Detroit, Michigan in July 2015, Hutten learned about Symach and what the system and process could do for the collision center. “I was intrigued by what I saw and after discussing the system with Osvaldo, I became more and more interested,” he said.